Josie Allgor, shop steward and rank and file member of CWA Local 1101 made her voice heard: “We are here to bring light to the tax evasion that Verizon is not so famous for now but we will make them famous for. They don’t pay their taxes but they can’t settle our contract. We just want a fair contract. So we have to shine a light on their negative side. We are the people who built their network. They are a multi-billion dollar profit company”. Contract negotiations with Verizon have been stalled for five months . 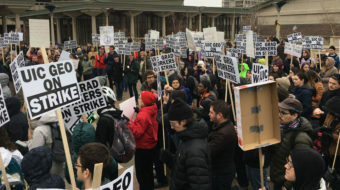 Local 1101 went on strike for two weeks back in August of 2011, but returned to work because Verizon seemed committed to settling the contact dispute in a fair way. 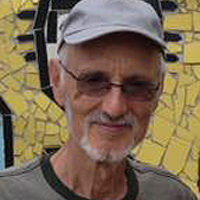 It was suggested by a CWA staff person that Verizon has been dragging their feet with the express purpose of having the negotiations go to a mediation board. That possibility could have a negative impact for the workers in this present economic environment. Many workers in the public and private sector have been losing ground in contract negotiation givebacks, e.g., health care costs, longer contracts and undercutting pensions. Chris Shelton, first Vice President District One, told the rally, “We can tell this company it’s time to give us a contract. We need every member of every local to guarantee us presence in the street every week so we can tell this company, settle this contract”. Greg Altieri a member for 35 years had this to say, “I’m out here in support of my union, we’re trying to get a fair contract from Verizon. We’ve been out here every Tuesday and Thursday since August and we still haven’t got a contract. We are trying to fight corporate greed and just get a contract for people who work every day and work very hard for a company that is making billions of dollars’. The International Brotherhood of Electrical Workers, who are also involved in these negotiations, are being asked by Verizon to freeze pension accruals, with no pensions for new hires, and to contribute at least $100 per month to their health-insurance premiums, among other items. Paula Martinez, with the New York Civic Participation Project, is a student and a working mom who supports Local 1101: “I’m defending my rights as a student. I’m facing hikes in my tuition while Verizon is getting millions in tax breaks. I can’t believe this is possible I’m here because I want to make my voice heard”. 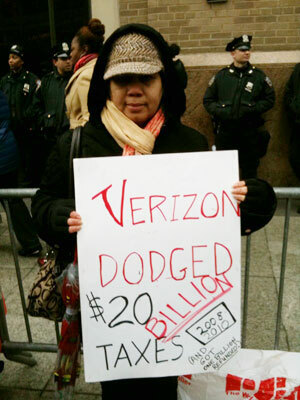 There was street theatre with the “Brooklyn Tax Dodgers” performing as Verizon. Cheers went up when demonstrators responded to the absurd excuses by the BTD for not paying their fair share! Bob Master, Political Director for CWA District One, spoke to the most pressing issue facing all working people in America today, “Verizon epitomizes everything that has gone wrong with this country… I mean it is really a case of the 1% vs. the 99%; they treat their workers the same way they treat the public… right, they are trying to drive down middle class jobs at the same time they are avoiding their obligations to pay taxes that run the government. 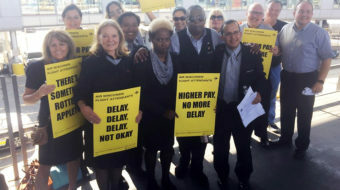 So we are out here today to make that connection between how they treat the work force and how they treat the public”. Some of the organizations that participated in the rally: Community Voices Heard, SEIU 32BJ, Make The Road, New York Civic Participation Project.